As i wake up this morning, When i opened the Television, i heard the news that our former president Corazon C. Aquino have passed away. For us youth, maybe, we do not know her essence & importance in our history. 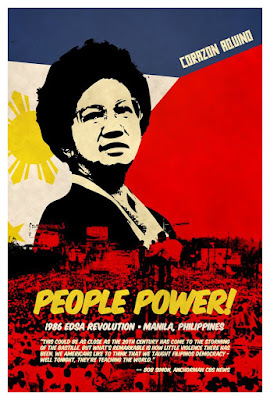 I've seen a lot of documentaries & stories in the television & in our subject before, the Philippine History about EDSA revolution 1 and her family's involvement in our democracy. Her husband, Ninoy Aquino sacrificed his own life for us filipinos to win back the democracy we were hunger for. Being a wife of a Ninoy Aquino, i think it's hard to continue her husband's fight, but still, she continued to fight for our freedom & democracy!. We must say that Cory C. Aquino is the mother of our democracy because of the courage she have shown in Martial Law way back in 1986. I believe that youth must know & learn that courageness, faithfulness & being God fearing is our key to get what we want, just like the mother of democracy have shown. In times of suffering in her cancer, still, she showed that she's strong & God fearing after all her trials. Also, she united the filipinos once more by prayers for her healing. Thank you for your unconditional love, Amen. There's also one sentence that she said in one of her interviews that i can't forget, she said" Nagpapasalamat ako sa Panginoon dahil ginawa niya akong Filipino at masaya ako na maging kagaya ninyo". This means that Filipinos must not be ashame of being Filipino. instead we must be thankful, proud & improve our culture & country for the next generations. Your memories, Mrs. Corazon C. Aquino will remain in our hearts & mind. And i promise that the next generations will still know your words, advocasies & your contribution in our history, not for me, but for the Filipinos & for our Country, the Philippines. Before i finish this post, i want to share this historical video that really touched my heart, & made me realized that our generation is so lucky & blessed that we have our freedom today because of her & Ninoy Aquino. * Please watch the video, not for the sake of this post but as a symbol of knowing the mother of democracy & our tribute for her. Let's also continue our prayers for her soul's journey. Hey steVe!! what a nice tribute to a modern day her. i was supposed to do that same thing too, however since so many people have done it i think i should do something different. ill gonna post something insulting but a bit funny soon, just a part of my upcoming pro-cory, anti-gloria schemes (hehe, naughty mind). hope you could read it too so that you could view my political horizon. kEep it up!! yeah. cora a, rest in peace dude. you'll always be remembered. @your comment: naah. tis not love! no way. haha. aww.. kuya steve! nice tribute! haha. i was like reading newspaper kanina. ung sa library namin. ung tatlo(inquirer.manila bulletin.phil star) or should i say newspapers. haha. and there a lot of behind stories about our beloved former pres. it feel so good na kahit na hindi mo mismo nakita ung mga nangyari nun. nababasa mo naman ngayun. at really thanks for her for really fighting for our freedom. there's this one article kanina. na ung bombing sa malacañang on her times. and pres cory was just like. "combing her hair" haha. so gutsy! thankss for the video. i really love the song nun! dapat sunod un sa national anthem naten. wahah..
you know. :(((( *speechless* even though di ko nasaksihan yung term niya, i still care kasi as what from i learned sa history namin she's one of the best president/mother/grandmother in the phil. :( awww. she'll forever be remembered. she made us proud to be a Filipino. that was really a sad new. everybody mourned! even me, though I wasnt their to witness the 1st edsa revolution. Her Prayer for a Happy Death was really touching!